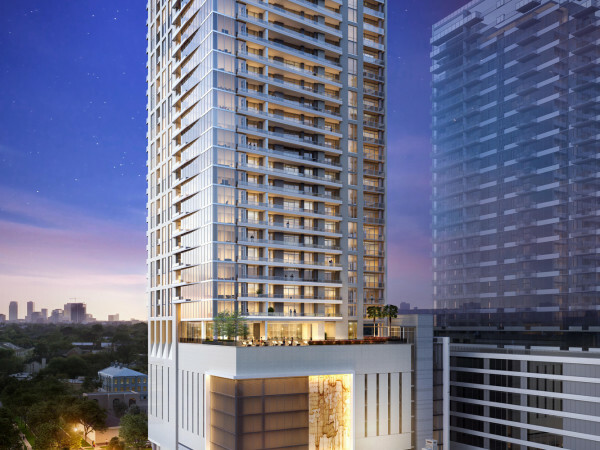 Market Square Tower, to become Houston's tallest downtown residential building at 40 stories. Rendering by Jackson & Ryan Architects courtesy of Woodbranch Investments Corp. Downtown living opportunities just shot sky high with plans for Market Square Tower, the urban core's largest residential project at 40 stories tall. The tower, with 463 apartments, will join several other residential highrises downtown. Market Square Tower will be built just off Market Square Park on a city block bounded by Preston, Louisiana, Milam and Congress streets. It will be located next to the current Market Square Garage, which will be reconfigured to accommodate tenants in the new highrise. Targeted for professionals working downtown, the new highrise will offer one-, two and three bedroom configurations ranging from 550-square-foot efficiencies to 1,950-square-foot apartments with three bedrooms and three baths. The average unit is to have more than 1,275 square feet, with rent at about $3,500. 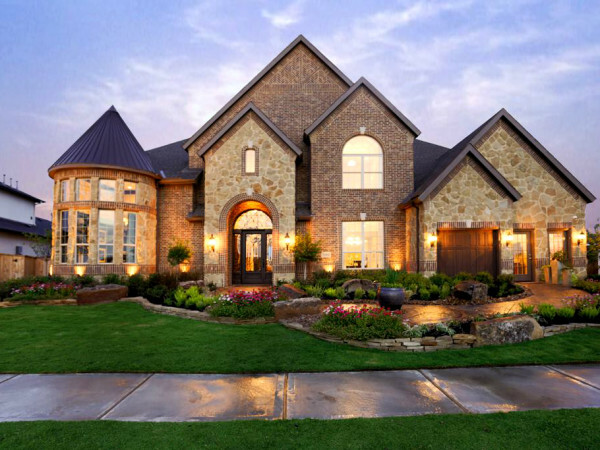 Rents will range from about $1,800 to $5,800 monthly. A limited number of larger penthouses are in the plans as well. 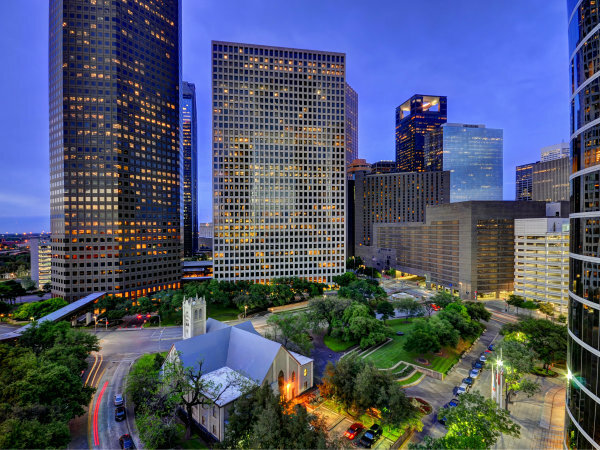 "This is not a starter apartment," Philip Schneidau, president of developer Woodbranch Investments Corp., told the Houston Chronicle, which first reported plans for the new building. It's not the only residential highrise planned for downtown. Just across Market Square, Hines is planning a 33-story residential tower offering "residents a five-star feel," according to the Ziegler Cooper Architects' website. The project includes 274 units atop an eight-story enclosed garage podium. An outdoor pool terrace is proposed for level nine, offering views of the historic park and downtown. And just down Main Street, probably about a half-mile down the light rail line, another residential tower, SkyHouse is climbing 24 stories with 336 one-, two- and three-bedroom rental units as well as studios. The project is nearing completion and is already 25 percent leased. Standard features at the Market Square Tower will include 10-foot ceilings, marble and granite kitchens and bathrooms, customized walk-in closets and oversized picture windows and balconies. It will also have an indoor basketball court, virtual golf simulator, screening room with lie-flat recliners and a banquet room that connects to the second-floor outdoor deck. The outdoor deck overlooking Market Square Park will have palm trees, cabanas, a swimming pool and Jacuzzi. Adjacent to the pool will be a luxury spa with sauna, steam and treatment rooms. The rooftop additions will include a cloud lounge, sky gym, sundeck and sky pool. A portion of the sky pool will be encased in glass, including the bottom, and cantilevers beyond the face of the building. About 22,000 square feet of street level retail space will also be available for lease through Shelby, Estus & Co.
Excavation is expected to begin by mid-August, with initial occupancy slated for January 2017. Jackson & Ryan Architects designed the building, and The Oakmont Group is the project manager.